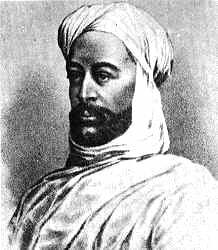 Muhammad Ahmad ibn as Sayyid Abd Allah (otherwise known as The Mahdi or Mohammed Ahmed) (August 12, 1844 – June 22, 1885) was a Muslim religious leader and a Sufi teacher, in the Anglo-Egyptian Sudan. He declared a jihad and raised an army after declaring himself the Mahdi, a Messianic figure in Islamic thought, in 1881, and led a successful war of liberation from the Ottoman-Egyptian military occupation. He also achieved a remarkable victory over the British, who were the de facto rulers of Egypt. Briefly, he led an independent Islamic state. He died of typhus soon after his liberation of Khartoum, where he defeated the British general, Charles George Gordon (1833-1885), who was killed in the battle. This made a British reprisal inevitable, which came in form of Horatio Herbert Kitchener, who later led the British during World War I. The state Ahmad founded fell to the British in 1899. Ahmad was an inspirational figure for many Muslims who also wanted to assert their right to self-determination against imperial and colonial powers. The experiment at Islamic governance was both short-lived and a failure, probably for the best. Sudanese do not remember it fondly. Following Ahmad's death, Abdellahi ruled as Khalifa. However, that state is the only example of a nineteenth-century African state freeing itself from colonial oppression and attempting to create its own institutions. It has even been described as the first African state to have been created by its own efforts—a free people who make mistakes have at least made their own mistakes. Ahmad tried to discourage feelings of tribal superiority, to replace tribalism with a common Muslim identity that crossed tribal barriers. A direct descendant of Ahmad, Sadiq al-Mahdi, has twice been prime minister of the Sudan (1966-1967 and 1986-1989) and pursued democratizing policies. Muhammad Ahmad was born in 1844 on Dirar Island off Dongola, the son of an indigent boat-builder and a member of an Arabized Nubian family from Dongola. They moved to Khartoum for better prospects for his family, and all of Muhammad's brothers entered the boatbuilding business, following their father. Muhammad instead focused on religious studies, as had his grandfather. The family was sharifian, or sayyids—that is, they claimed descent from the Prophet Muhammad. He learned the Qur'an in Khartoum and Kararie, and later he studied fiqh (law) under Sheikh Muhammad Kheir. He was interested mostly in Sufi teachings. In 1861 he approached Sheikh Muhammad ash Sharif, the leader of Sammaniyya Sect, to join his students and learn more on Sufism. When Sheikh Muhammad realized Muhammad's dedication he appointed him sheikh, and permitted him to teach the path (Tariqah) to new followers. In 1871 his family moved again to Aba Island in western Sudan where he built a mosque and started to teach the Qur'an. He soon gained a notable reputation among the local population as an excellent speaker and mystic. The broad thrust of his teaching followed that of other reformers; his Islam was one devoted to the words of the prophet and based on a return to the virtues of prayer and simplicity as laid down in the Qur'an. Any deviation from the Qur'an was considered heresy. Over the next ten years he traveled widely, to Dongola, Kordofan and Sinnar. During his travels he was struck by the hatred for the Ottoman-Egyptian rulers, and found that as soon as anyone educated and well-spoken appeared, the local populations would declare him Mahdi and hope for his deliverance. He was joined on his travels by Abdallahi ibn Muhammad, a Baqqara from southern Darfur, whose organizational capabilities proved invaluable. On his return to Aba Island in 1881 Ahmad proclaimed himself Al Mahdi al Muntazar (“expected one”) and started to raise an army. Ahmad used a V-shaped gap in his teeth to prove he was the Mahdi. The British played an important role in the series of events. In 1869 the Suez Canal opened, and to defend the waterway Britain sought a greater role in Egyptian affairs. In 1873 the British government supported a program where an Anglo-French debt commission assumed responsibility for managing Egypt's fiscal affairs. This commission eventually forced the Khedive, Ismail to abdicate in favor of his son Tawfiq in 1877, leading to a period of political turmoil. Ismail had appointed Charles George Gordon to the post of governor general of Sudan in 1877. Soon after he arrived he started to end the slave trade, which at that point was majority of the economy. Before his arrival some seven out of eight ethnic Sudanese were enslaved by the tiny minority of Arabs, well over 80 percent of the overall population. Gordon's policies were effective, but the effects on the economy were disastrous, and soon the population saw this not liberation from slavery but a modern-day European Christian crusade. It was this anger that fed the Ansar's ranks. Upon Ismail's abdication Gordon found himself with dramatically decreased support. He eventually resigned his post in 1880, exhausted by years of work, and left early the next year. His policies were soon abandoned by the new governors, and the anger of local population was left unchecked. Although the Egyptians were fearful of the deteriorating conditions, the British refused to get involved: "Her Majesty’s Government are in no way responsible for operations in the Sudan," the foreign secretary, Earl Granville, noted. Even after Ahmad proclaimed a jihad, or holy war, against the Turkiyah, he was dismissed as a religious fanatic. The government paid more attention when his religious zeal turned to denunciation of tax collectors. To avoid arrest, Ahmad and a party of his followers, the Ansar (known in the west inaccurately as the Dervishes), made a long march to Kurdufan. There he gained a large number of recruits, especially from the Baqqara. He also wrote to many Sudanese tribal leaders and gained their support, or at least neutrality, and he was also supported by the slave traders who were looking to return to power. They were also joined by the Hadendowa Beja, known as the Fuzzy-wuzzies, who were rallied to Ahmad by an Ansar captain, Usman Digna. Late in 1883, the Ansar, armed with spears and swords, overwhelmed an eight thousand-man Egyptian force not far from Al Ubayyid (El Obied) in the Battle of El Obied, and seized their rifles and ammunition. Ahmad followed up this victory by laying siege to Al Ubayyid and starving it into submission after four months. The town remained the headquarters of the Ansar for much of the decade. The Ansar, now 30,000 strong, then defeated an eight thousand-man Egyptian relief force at Sheikan, captured Darfur, and, in 1883, took Jabal Qadir in to the south. The western half of the Sudan was now largely in Ansar hands, and this state of affairs lasted for several years. Their success emboldened the Beja, who wiped out a smaller force of Egyptians under the command of Colonel Valentine Baker near the Red Sea port of Suakim. Major-General Gerald Graham was sent with a force of four thousand British and defeated Digna at El Teb on February 29, but was hit hard two weeks later at Tamai. Graham eventually withdrew his forces. Given their general lack of interest in the area, the British decided to abandon the Sudan in December 1883. While their forces still held several northern towns and Red Sea ports, they ordered Gordon to return to Khartoum and organize a withdrawal of the Egyptian garrisons there. Gordon reached Khartoum in February 1884. At first he was greeted with jubilation, as many of the tribes in the immediate area were at odds with the Mahdists. Transportation northward was still open, and the telegraph lines intact. However, the uprising of the Beja soon after his arrival changed things considerably, reducing communication to runners. He considered the routes northward to be too dangerous to extricate the garrisons, and so pressed for reinforcements to be sent from Cairo to help with the withdrawal. He also suggested that his old enemy Zubayr, a fine military commander, be given tacit control of the Sudan in order to provide a counter to the Ansar. London rejected both proposals, so Gordon prepared for a fight. In March 1884 Gordon tried a small offensive to clear the road northward to Egypt, but a number of the officers in the Egyptian force went over to the enemy and their forces fled the field after firing a single salvo. This convinced him that he could carry out only defensive operations, and he returned to Khartoum to construct defensive works. By April 1884 Gordon had managed to evacuate some 2,500 of the foreign population that were able to make the trek northwards. His mobile force under Colonel Stewart then returned to the city as well, after repeated incidents where the two hundred or so Egyptian forces under his command would turn and run at the slightest provocation. That month the Ansar had reached Khartoum, and Gordon was completely cut off. Nevertheless his defensive works, consisting mainly of mines, proved so frightening to the Ansar that they were unable to penetrate into the city. Stewart maintained a number of small skirmishes using gunboats on the Nile once the waters rose, and in August managed to recapture Berber for a short time. However, Stewart was killed soon after in another foray from Berber to Dongola, a fact Gordon only learned about in a letter from Ahmad himself. Under increasing pressure from the public to support him, the British eventually ordered Lord Garnet Joseph Wolseley to relieve Gordon. He was already deployed in Egypt due to the attempted coup there earlier, and was able to form up a large force of infantry, moving forward at an extremely slow rate. Realizing they would take some time to arrive, Gordon pressed for him to send forward a "flying column" of camel-borne troops under the command of Brigadier General Sir Herbert Stuart. This force was attacked by the Mahdists at Abu Klea and wiped out. At Metemma, one hundred miles north of Khartoum, Wolesely's advance guard met four of Gordon's steamers, sent down to provide speedy transport for the first relieving troops. They gave Wolesely a dispatch from Gordon claiming that the city was about to fall. However, only moments later a runner brought in a message claiming the city could hold out for a year. Deciding to believe the later, the force stopped while they refit the steamers to hold more troops. They finally arrived in Khartoum on January 28, 1885, to find the town had fallen two days earlier. The Ansar had waited for the Nile spring flood to recede before attacking the poorly defended river approach, overcoming the garrison. Gordon was killed on the steps of the palace and beheaded, although Ahmad had expressly ordered for him to be taken alive. Wolesely's force retreated after attempting to force their way to the center of the town on ships, being met with a hail of fire. Kassala and Sannar fell soon after, and by the end of 1885 the Ansar had begun to move into the southern regions of Sudan. In all Sudan, only Suakin, reinforced by Indian Army troops, and Wadi Halfa on the northern frontier remained in Anglo-Egyptian hands. With Sudan now in Sudanese hands, Ahmad formed a government. The Mahdiyah (Mahdist regime) imposed traditional Islamic laws. Sharia courts enforced Islamic law and the Mahdi's own commands. He also authorized the burning of lists of pedigrees and books of law and theology because of their association with the old regime, and because he believed that they accentuated tribalism at the expense of religious unity. Ahmad modified Islam's five pillars to support the dogma that loyalty to him was essential to true belief. Ahmad also added the declaration “Muhammad Ahmad is the Mahdi of God and the representative of His Prophet” to the recitation of the shahada. Moreover, service in the jihad replaced the hajj pilgrimage to Mecca as a duty incumbent on the faithful. Zakat (almsgiving) became the tax paid to the state. Ahmad justified these reforms as responses to instructions conveyed to him by God in visions. Six months after the capture of Khartoum, Ahmad died of typhus. Ahmad had planned for this eventuality and chosen three deputies to replace him, in emulation of the Prophet Muhammad. This led to a long period of disarray, due to rivalry among the three, each supported by people of his native region. This continued until 1891, when Abdallahi ibn Muhammad, with the help primarily of the Baqqara Arabs, emerged as unchallenged leader. Abdallahi, referred to as the Khalifa (successor), purged the Mahdiyah of members of Ahmad's family and many of his early religious disciples. The Khalifa was committed to Ahmad's vision of extending the Mahdiyah through jihad, which led to strained relations with practically everyone else. For example, the Khalifa rejected an offer of an alliance against the Europeans by Ethiopia's negus (king), Yohannes IV of Ethiopia. Instead, in 1887 a 60,000-man Ansar army invaded Ethiopia, penetrated as far as Gonder, and captured prisoners and booty. The Khalifa then refused to conclude peace with Ethiopia. In March 1889, an Ethiopian force, commanded personally by the king, marched on Gallabat; however, after Yohannes IV fell in battle, the Ethiopians withdrew. Abd ar Rahman an Nujumi, the Khalifa's best general, invaded Egypt in 1889, but British-led Egyptian troops defeated the Ansar at Tushkah, the first battle the Mahdiyah lost. Further attacks into Equatoria were stopped by the Belgians, and in 1893 the Italians repulsed an Ansar attack at Akordat (in Eritrea) and forced the Ansar to withdraw from Ethiopia. By this point British interest in the area was once again growing, due to the interest of the French and Belgians in nearby areas. As each of these forces moved up the Nile, the British felt they required a presence in the Sudan in order to validate their claims to it via Egypt's annexation. In 1892 General Horatio Herbert Kitchener had been promoted to the post of commander in Egypt, and in 1895 they started plans for the re-conquest of the Sudan. Kitchener's forces, the Anglo-Egyptian Nile Expeditionary Force, consisted of 25,800 men, including 8,600 British regulars, and a flotilla of gunboats. They reached and fortified Wadi Halfa in 1895, and started south at a very slow pace the next March. In September, Kitchener captured Dongola and constructed several rail lines to ensure supplies. There were small battles at Abu Hamad and Atbara, both times the Ansar were defeated by the massive English firepower which now included Maxim machine guns. Kitchener then marched on Omdurman. On September 2, 1898, the Battle of Omdurman opened with a frontal assault by the Mahdiyah's 52,000-man army. Over the next five hours some 11,000 of their forces would be killed, against about 40 of the Anglo-Egyptian forces (and about four hundred wounded). The Mahdiyah ended at this point and the British once again took control of the Sudan. The Khalifa escaped and reformed an army, but this was defeated in 1899 at the Battle of Umm Diwaykarat and the Khalifa was killed. During their short reign, the Mahdiyah had destroyed the Sudanese economy, and about half of the population died due to famine, disease, persecution, and warfare. Their efforts to wipe out the former tribal differences left few loyalties intact, and internecine warfare was common. In general, the country welcomed the fall of the Mahdiyah. Mirak-Weissbach, Muriel. "Why the British Hate Sudan: The Mahdia's War Against London." The American Almanac (September 4, 1995). Retrieved August 7, 2007. This page was last modified on 3 April 2008, at 17:26.